In the latter half of 2018, both the federal and state governments released new climate change assessments that outline the projected course of climate change and its potential effects on water resources. Both federal and state assessments include chapters on water resources and California’s Fourth Climate Change Assessment includes two reports about the impacts of climate change on the State Water Project. At the December meeting of the California Water Commission, staff from the Department of Water Resources and the Delta Stewardship Council were on hand to present an overview of the newly released assessments. Kevin He, an engineer with the Department of Water Resources, then gave a brief overview of the major findings contained within the Fourth National Climate Assessment (or NCA4), which was a joint effort of over 300 people in different fields across the nation, including three people from three California state agencies. Mr. 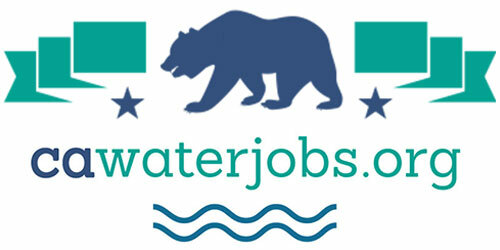 He served as a review editor for the water chapter with the support of DWR’s climate change program and the Bay Delta Office. The US Global Change Research Program (USGCRP) was established by Presidential Initiative and mandated by Congress in the Global Change Research Act (GCRA) of 1990 to develop and coordinate “a comprehensive and integrated United States research program which will assist the Nation and the world to understand, assess, predict, and respond to human-induced and natural processes of global change.” The USGCRP works across 13 federal agencies to advance understanding of the changing Earth system and maximize efficiencies in global change research. The USGCRP is required to produce a synthesis report of climate impacts and trends across the nation every four years. The intention of the NCA is to inform resource managers, officials, and stakeholders in considering climate-related risks in their decision making by distilling a large body of research into a report framed around risks to people and resources. It also serves as a more general educational resource about what’s at stake for society as a result of climate change. The report, known as the National Climate Assessment (NCA), was first produced in 2000, with subsequent iterations released in 2009 and 2014. The Fourth National Climate Assessment has two volumes. 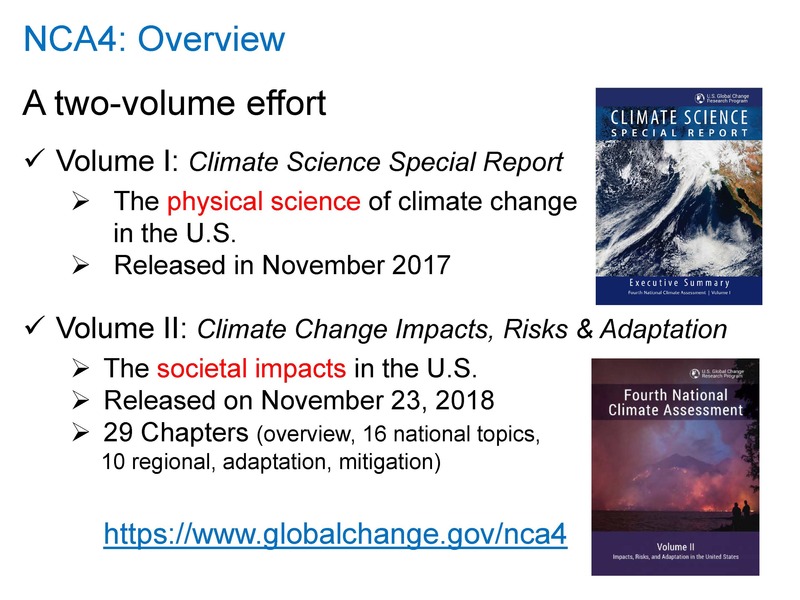 The first volume, released in November, 2017, focuses on the physical science of climate change; the second volume, released in November of 2018, focuses on societal impacts with 29 chapters and has chapters that cover topics such as water, energy, transportation, ecosystem, coast, forest, and human health, as well as ten regional chapters, one adaptation chapter, and one mitigation chapter. Mr. He gave the major findings of the NCA4. Our climate is changing faster than at any point in modern civilization and those changes are mostly the result of human activities. The corresponding impacts are being felt across the nation. The climate is projected to change even faster in the future, with temperature possibly increasing by 5 to 8.7 degrees Fahrenheit by the end of this century. Secondly, climate change presents growing challenges to our economy, infrastructure, natural environment, human health, and quality of life. For example, the GDP could potentially lose up to 10% by 2100 if no major action is taken to fight climate change, he said. 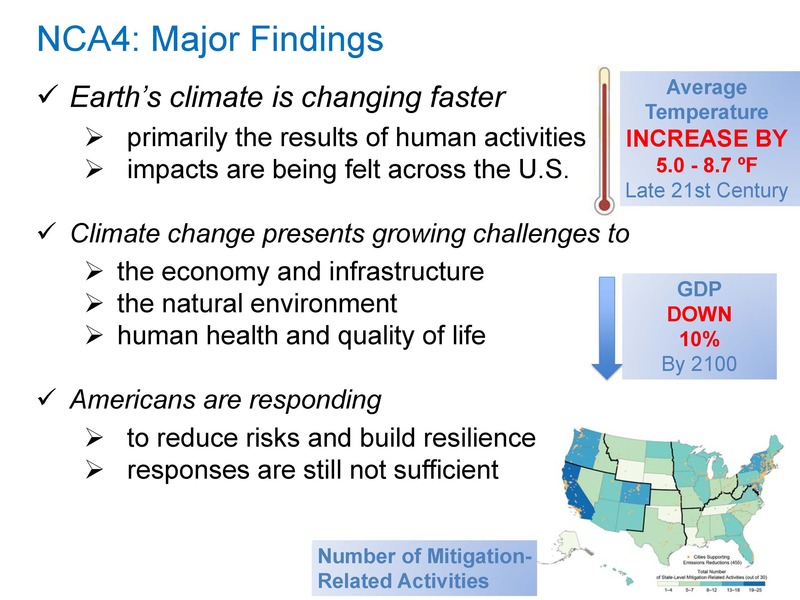 However, Americans are taking actions to reduce risks and build resilience. 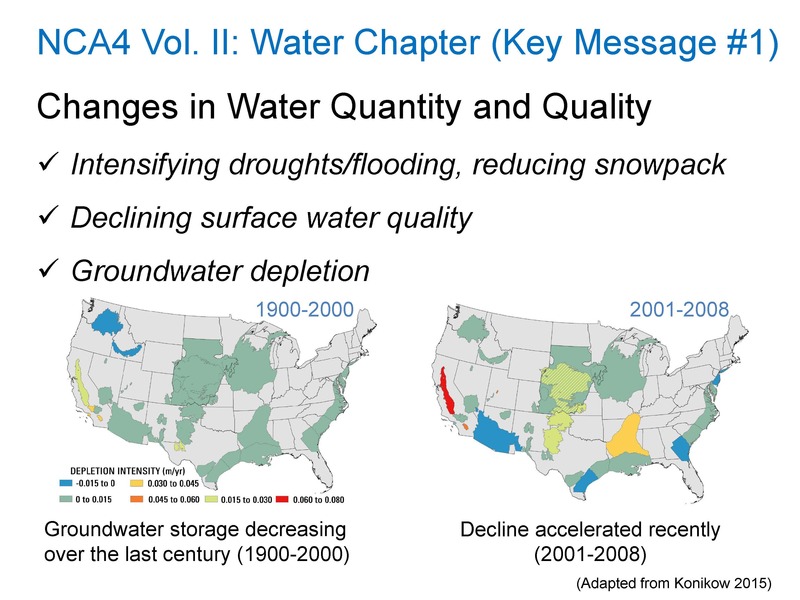 The first key message is that water quality and water supply are changing due to multiple factors: Intensifying droughts, floods, and hurricanes; the snowpack is becoming smaller, surface water quality is declining, and groundwater storage is being depleted, he said. The two figures on the slide indicate the groundwater depletion rate in regional major aquifers across the nation in two different periods: from 1900 to 2000 on the left and 2001 to 2008 on the right with warmer colors indicating a higher depletion rate, with red being the highest depletion rate. The second key message is that the nation’s water infrastructure is aging and deteriorating and at a higher than normal risk in a changing climate. 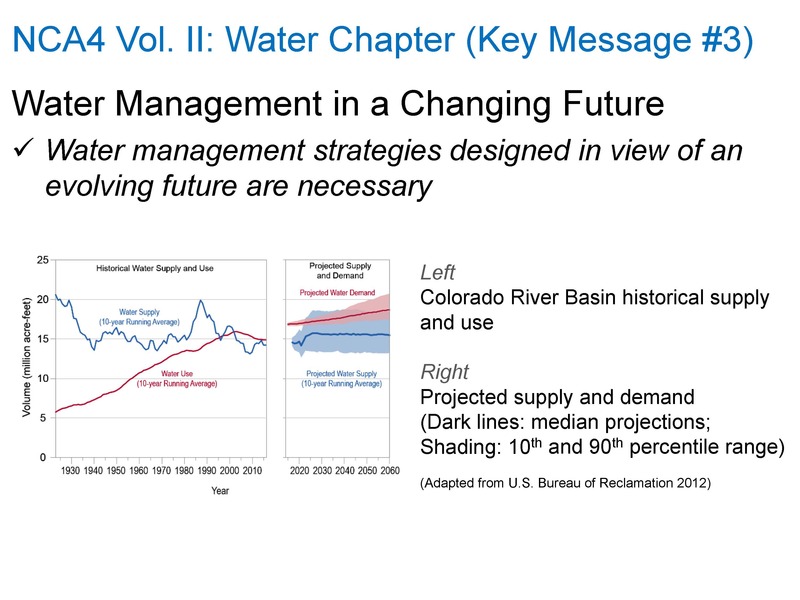 The third key message as that in light of the changing climate, changing water, and changing water infrastructure, our current water management strategies and planning principles do not consider the risks of change with time, so we need to change that and we need to be flexible, he said. “Simply put, how much water we have tomorrow and how good our water will be tomorrow depends on how proactive and how adaptive we could be today,” concluded Mr. He. Jianzhong (Jay) Wang works for the Department of Water Resources; he spoke next about California’s Fourth Climate Change Assessment Report that was released in August and a report that was produced for the effort, Mean and Extreme Climate Change Impact on the State Water Project. 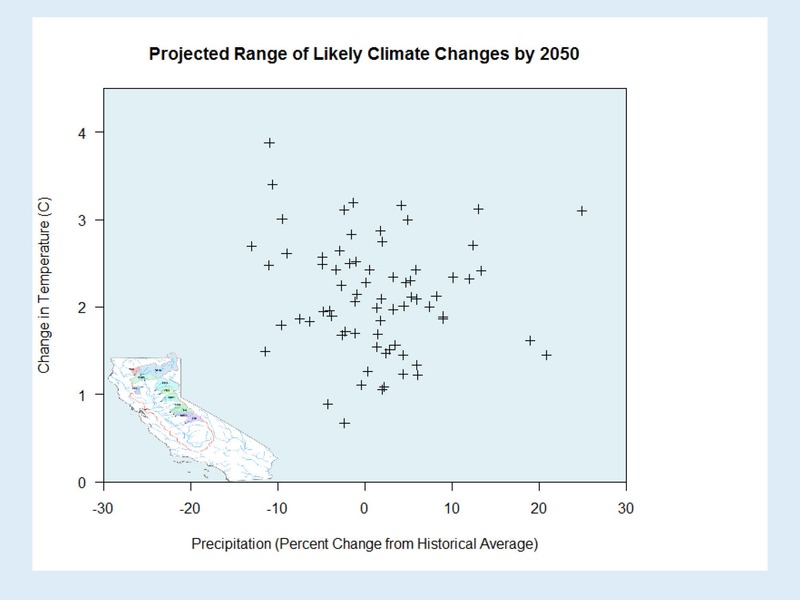 The main goal of the report was to assess climate change impacts on the State Water Project and the Central Valley Project at the middle of this century (from 2045 to 2074, centered at year 2060) due to rising temperatures, shifting precipitation patterns, and sea level rise. Rising temperatures, earlier and faster snow melting, and a higher ratio of precipitation due to the warming are causing monthly flow pattern shifting. Future water demand for agriculture is expected to rise because of the future warming increasing potential evapotranspiration rate. In developing the report, the newest release of Cal SIM III was used to assess the impacts. 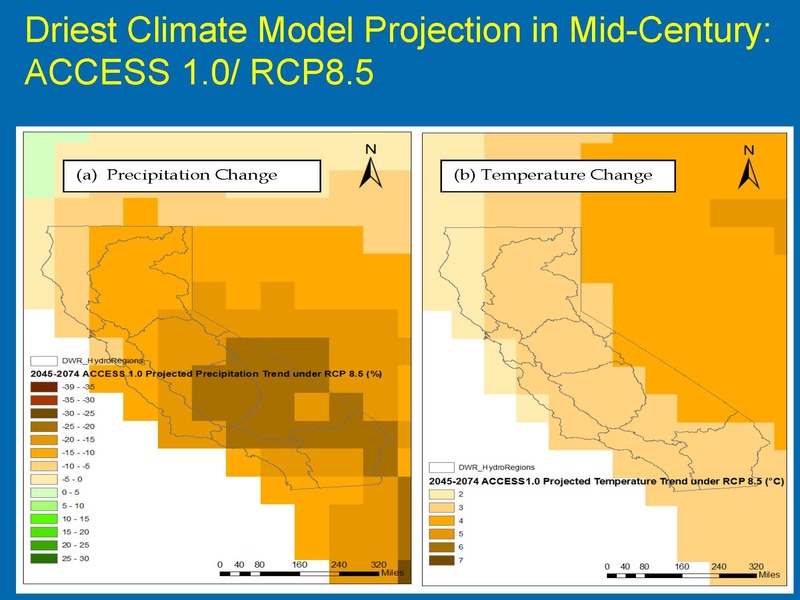 To perform the analysis, they first assessed climate change impacts on model inputs such as rim inflow, mean streamflow in the upper watershed of the Sierra Nevada mountains, sea level rise in the San Francisco Bay, agricultural water demand in the Valley, and river indexes such as the Sacramento River Index and the San Joaquin River index, and others. 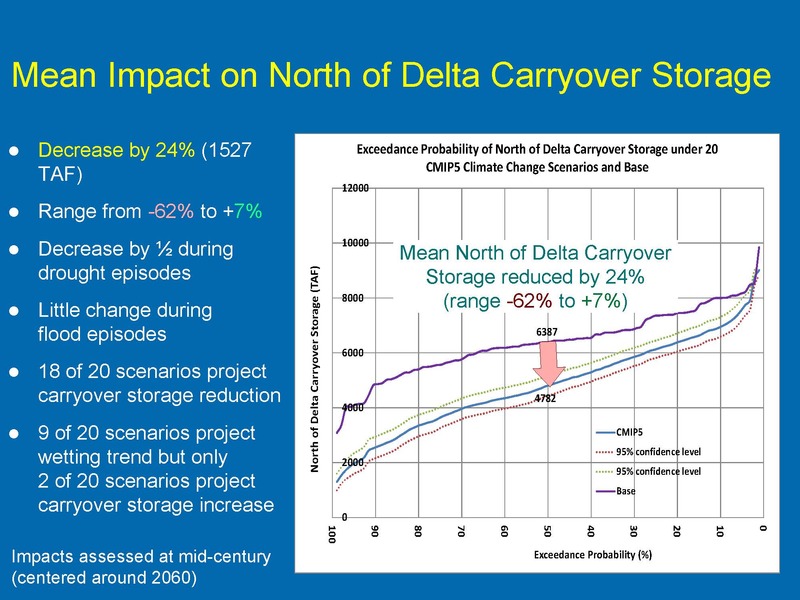 Then they did model runs and assessed climate change impacts on model outputs such as Delta outflow, Delta exports, carryover storage in north-of-Delta reservoirs, system reliability, and X2. 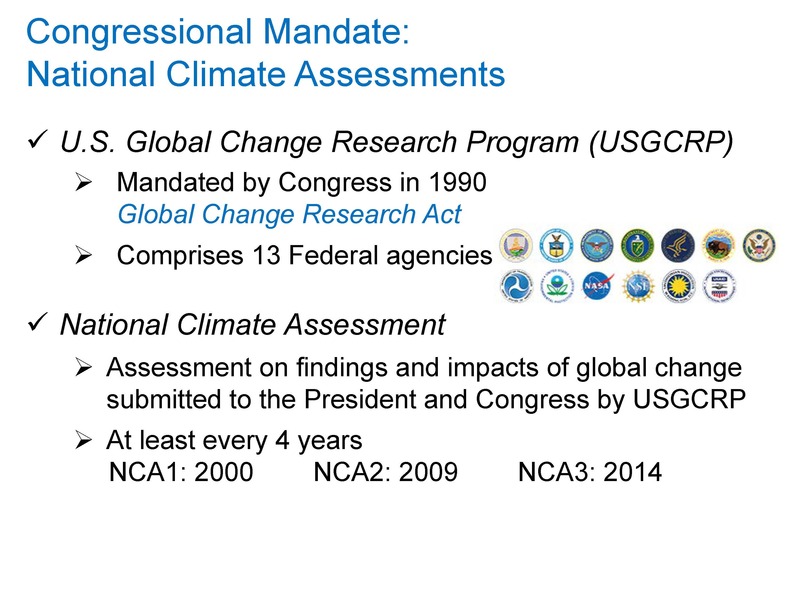 The approach used for the assessment originates from the first climate change assessment report in 2006 and the second assessment report in 2009. 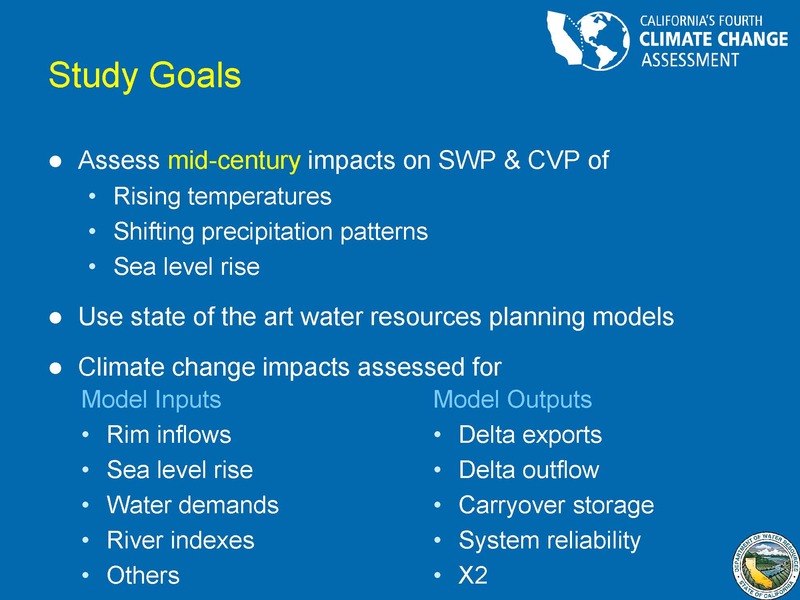 The first step is to select the global climate models projections to use; DWR’s Climate Change Technical Advisory Group selected 20 Coupled Model Intercomparison Project Phase 5 (CMIP5) global climate model projections, including 10 global climate models. Two greenhouse gas emissions scenarios were selected, model rate emission scenario Representative Concentration Pathways (RCP) 4.5 and the highest greenhouse gas emissions scenario, RCP 8.5. The second step was to downscale the projections as the grid size for global climate models at 100-200 kilometers is too big. They downscaled the temperature and precipitation data to grids of 10 kilometers using a method developed by Scripps Institute of Oceanography called LOCA, or Localized Construction Analog. The third step is to use a hydrological model called Variable Infiltration Capacity Model to generate runoff and streamflow for the Sacramento River Basin and the San Joaquin River Basin with the downscaled global model projections. The fourth step was to assess climate change impacts on model inputs. Rather than putting the above generated streamflow directly into CalSim model, Mr. Wang explained they used climate change information embedded in streamflow from the year 1950 to end of this century to calculate the perturbation ratio and the historical flow from 1992 to 2015 to generate a climate change effect on streamflow. They also determined the estimated sea level rise in San Francisco Bay and the estimated agricultural water demand change for each global climate model projection. 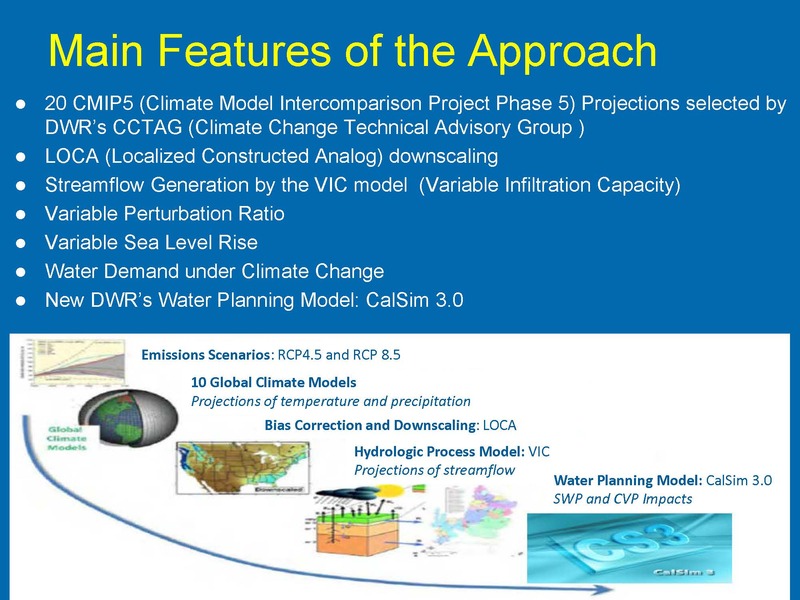 The fifth and last step was to use the latest iteration of DWR’s water planning model, CalSim 3, for each global climate model projection and then analyze mean and extreme climate change impact on the State Water Project and Central Valley Project, including Delta export and the Delta outflow. The left panel shows the average change in precipitation of 20 climate change scenarios for the middle century. Green color stands for precipitation increase and the yellow color stands for precipitation decrease. “Overall, they project a wetter climate in Northern California and dry climate in Southern California in mid-century,” said Mr. Wang. The right panel is average change of temperature over 20 climate change scenarios in middle century. 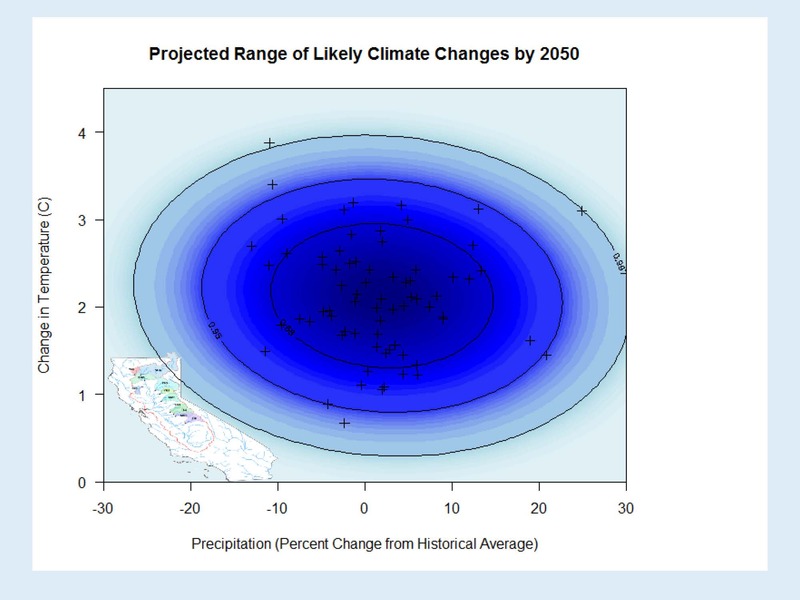 Overall, California is projected to become 1.5 to 3.0 Celsius degrees in the middle of the century than current climate with the greatest warming occurring inland. The models project a precipitation increase in the middle of the century on average with rim flow in the Sacramento River increasing by 4.4% or about 900 TAF. Most of the streamflow increase would occur during the winter high flows. The left panel is an exceedance probability curve for annual rim flow to Sacramento River Basin for the middle of the century, showing the range of high flows projected (the blue line) as compared to the current climate base line (shown in purple); the dashed line is the 95% confidence curve. The right panel shows the average projected monthly rim inflow to Sacramento River Basin for base and middle of century scenario. Blue line is for the middle century climate change scenario; purple line is for base scenario without climate change. For sea level rise, each model projection was assigned either .5, 1 foot, and 1.5 foot sea level rise based on the middle century surface air temperature at San Francisco Bay. 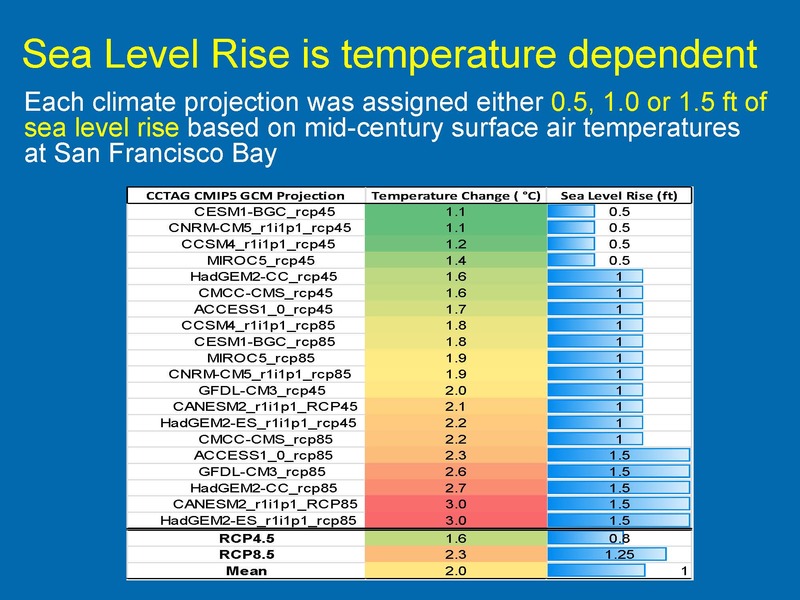 The first column in the table are the names for 20 climate change scenarios; the second column is temperature change in San Francisco Bay in the middle of century compared to the current climate; and the third column is the sea level rise in San Francisco Bay assigned to each climate model projection. There are four climate change scenarios with a half a foot of sea level rise, eleven climate change scenarios with 1 foot sea level rise, and 5 climate change scenarios with 1.5 foot sea level rise. Mean sea level rise is about 1 foot on average for the middle of century; Mr. Wang acknowledged this is a conservative estimate. Rising temperatures will increase the crop evapotranspiration rate, thereby increasing agricultural water demand. 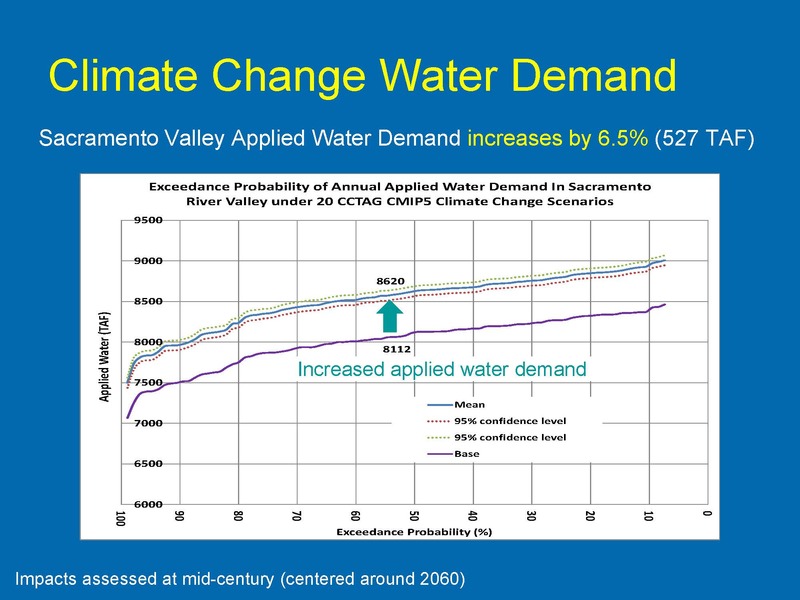 The figure shows exceedance probability curve of annual applied water demand in Sacramento River Valley for the mean of the 20 middle century climate change scenarios; the blue line is the climate change scenario for the middle century and the purple line is the base scenario. 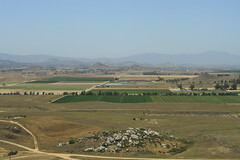 “The Sacramento Valley agricultural demand will increase 527 TAF on average, about half a million acre-feet increase by 6.5% if other things do not change, such as land use remains unchanged, crop types remain unchanged,” Mr. Wang said, noting that this calculation doesn’t consider a number of other factors, such as carbon dioxide increases or the growing period change. 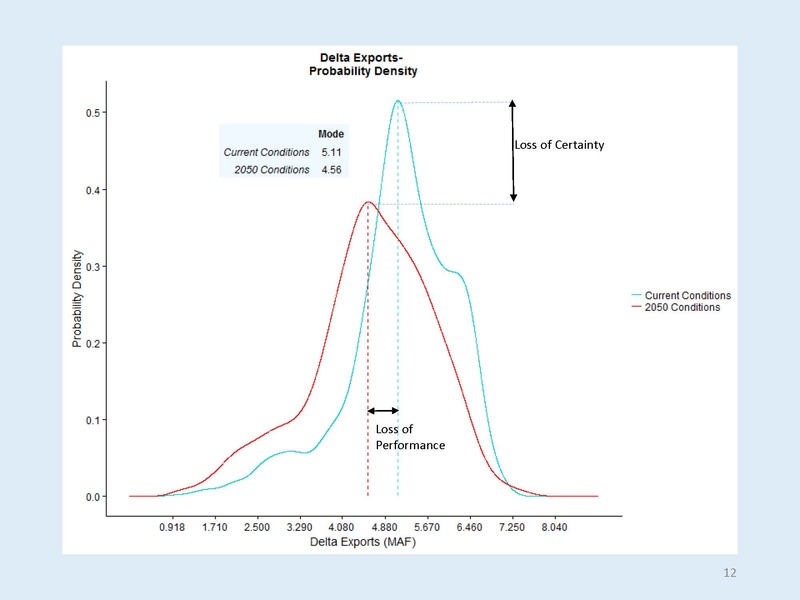 The figure on the slide shows the exceedance probability curve for south of Delta exports for the middle of century scenario, which is the blue line; the base scenario is the purple line. 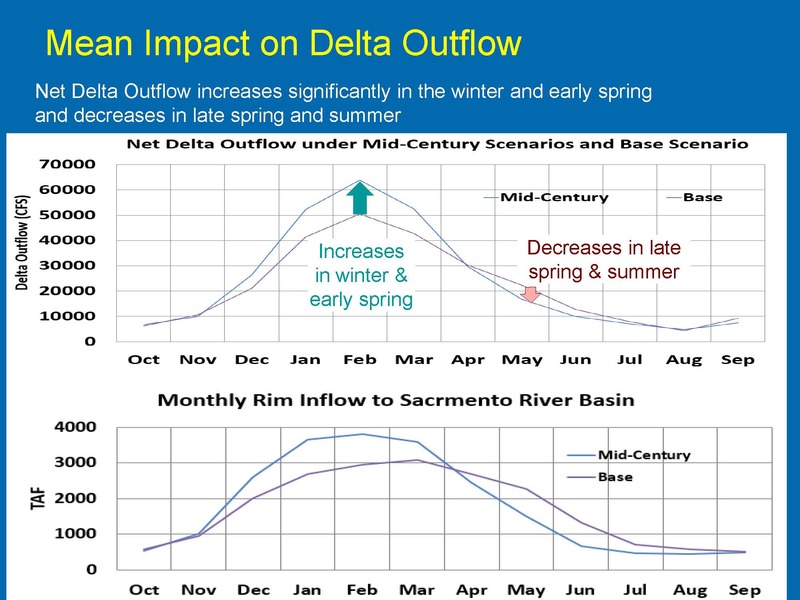 He then presented a slide showing the mean impact on Delta outflow. 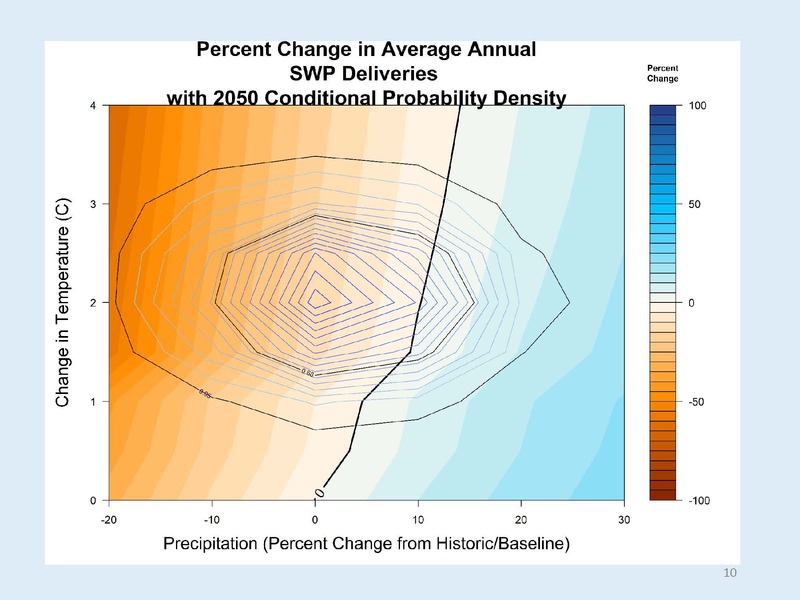 The upper panel is net monthly Delta outflow averaged over 20 climate change scenarios shown by the blue line and the Delta outflow base scenario as the purple line. He noted that net Delta outflow increases significantly in the winter and early spring, and it decreases in late spring and summer because of climate change. To assess extreme impact on State Water Project and Central Valley Project, the driest climate model project for the middle century made by the Australia climate model ACCESS 1.0 on the highest emission scenario, RCP 8.5, was selected. 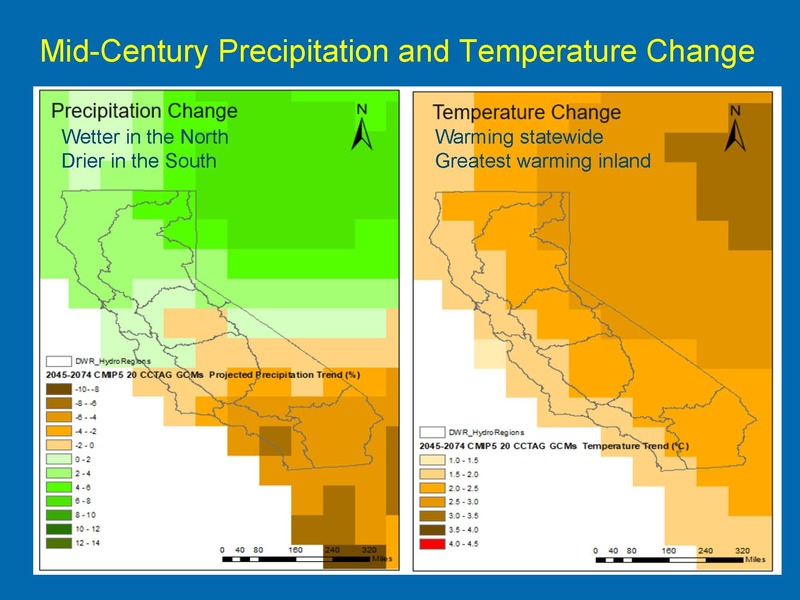 The left panel shows the precipitation change in the middle century compared to the current climate; yellow means precipitation is reduced in the middle century statewide by 5% to 25%. The right panel shows the temperature change in middle century compared to the current climate; an increase in 2 to 3 degrees Celsius is projected. 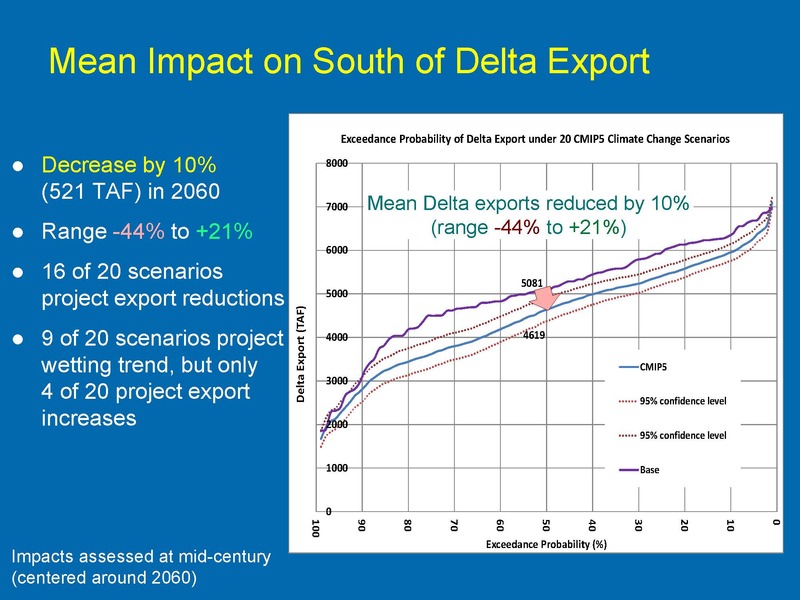 He then presented a slide showing the impact of the extreme scenario on South of Delta exports. The figure show the south of Delta exports for the middle century as the blue bar and Delta exports for the base scenario show in purple for two historical drought periods: the 1987-1992 drought and the 1929-1932 drought. 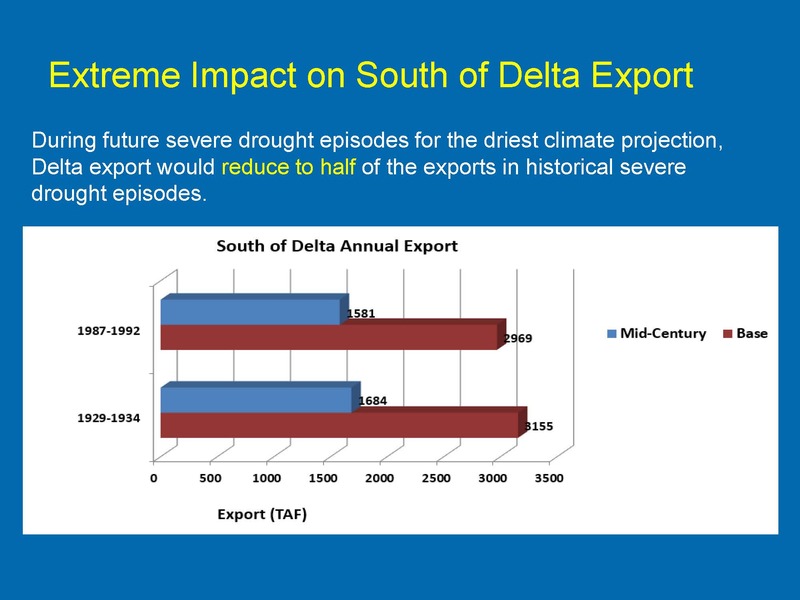 During the 1987-1992 drought, Delta exports were 2969 TAF, but in the middle of century, this kind of drought becomes more severe under the driest climate change scenario, with Delta exports reduced to 1581 TAF in the middle of century, or reduced to half. For the 1929 to 1932 drought, Delta exports has 3155 TAF but in the middle of century, Delta exports were reduced to 1684 TAF. 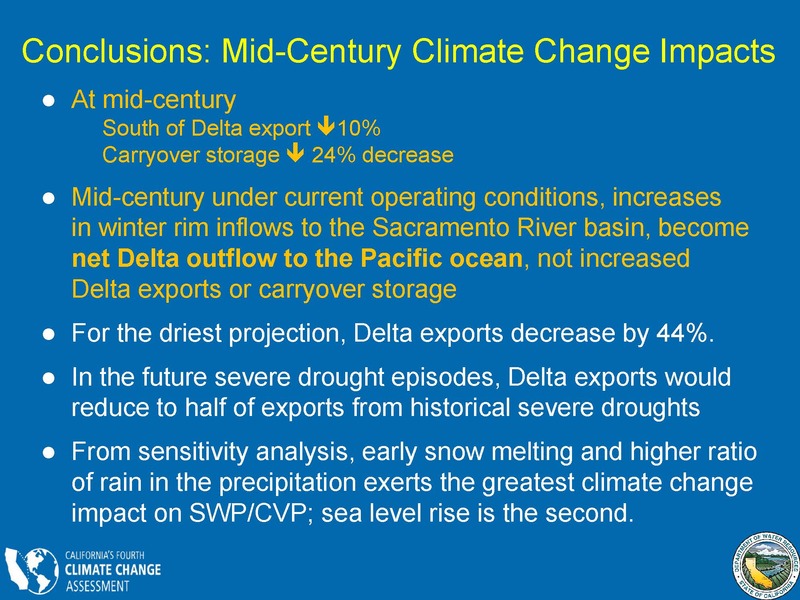 “For the driest climate model projection, Delta exports were reduced to half of exports in historical severe drought episodes,” said Mr. Wang. 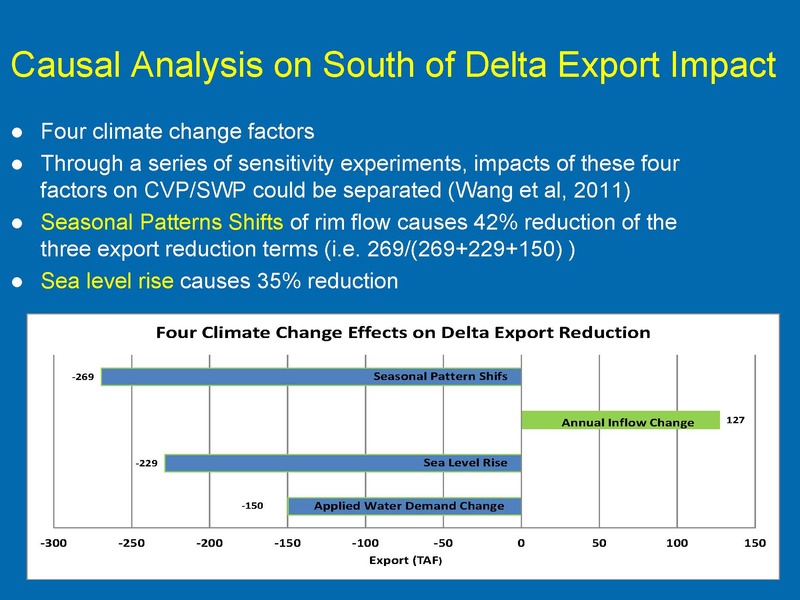 Digging deeper into the impacts to south of Delta exports, there are four climate change factors that affect the State Water Project and the Central Valley Project: Seasonal flow pattern shift due to early snow melting and the higher rain ratio in the precipitation, sea level rise due to global warming, agricultural water demand change due to the increased crop evapotranspiration rate, and the annual rim inflow change due to the future precipitation change. 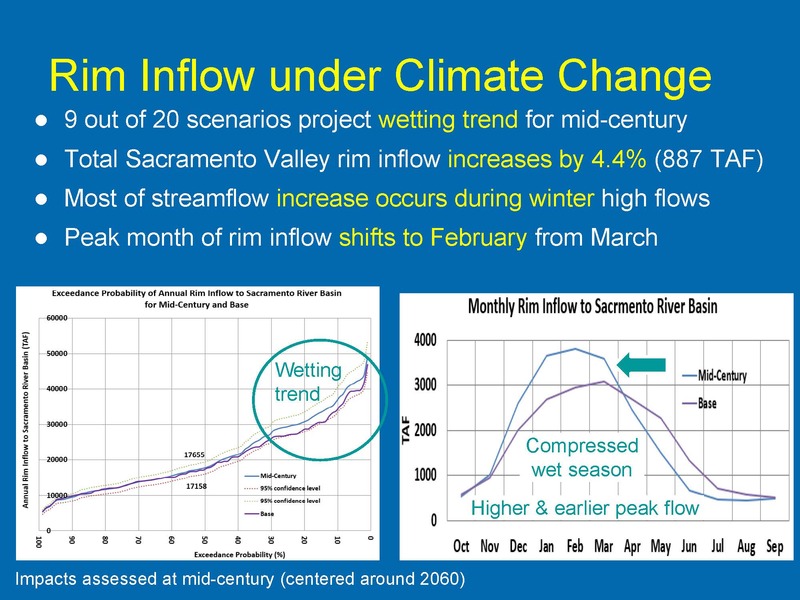 Commissioner Ball then notes that there is higher rim inflow on the Sacramento River, and an impact relative to temperature change on the snow, so wouldn’t we be able to capture in storage that increased amount of water? Andrew Schwartz is one of the authors of the report, Climate Change Risks Faced by the California Central Valley Water Resource System, which was also prepared as part of California’s Fourth Climate Change Assessment Report. 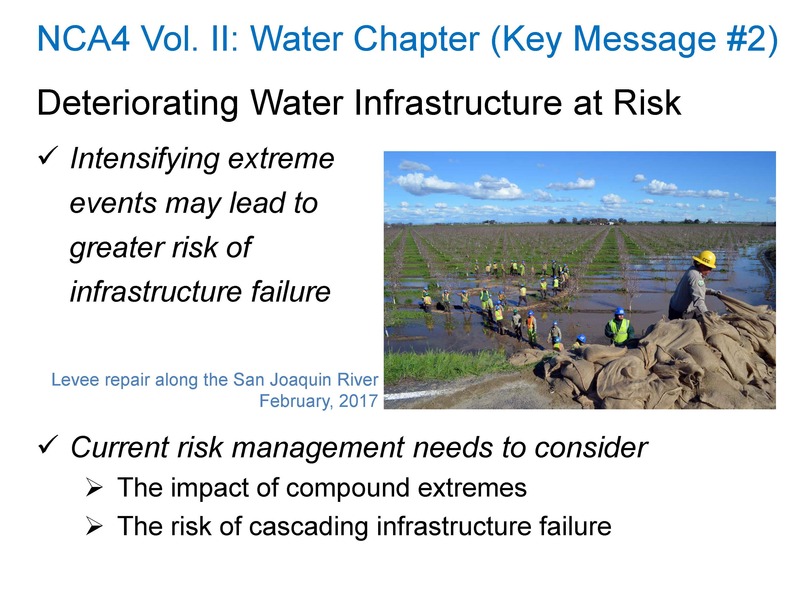 Mr. Schwartz is working with the Delta Stewardship Council now, but when he worked on this report, he was working at the Department of Water Resources under John Andrew’s supervision. This project was a collaboration between the Department of Water Resources and a research group at the University of Massachusetts Amherst. Mr. Schwartz said he would contrast the two studies, but he doesn’t want it to be interpreted that the previous study isn’t relevant; it provides useful information; this type of study provides a different type of information, and there are ways to use them both. 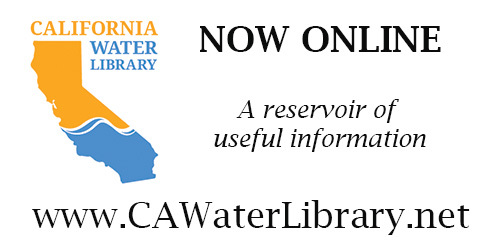 The study area was the State Water Project and Central Valley Project watersheds that flow into Oroville, Shasta, and Folsom and provide water for those projects. 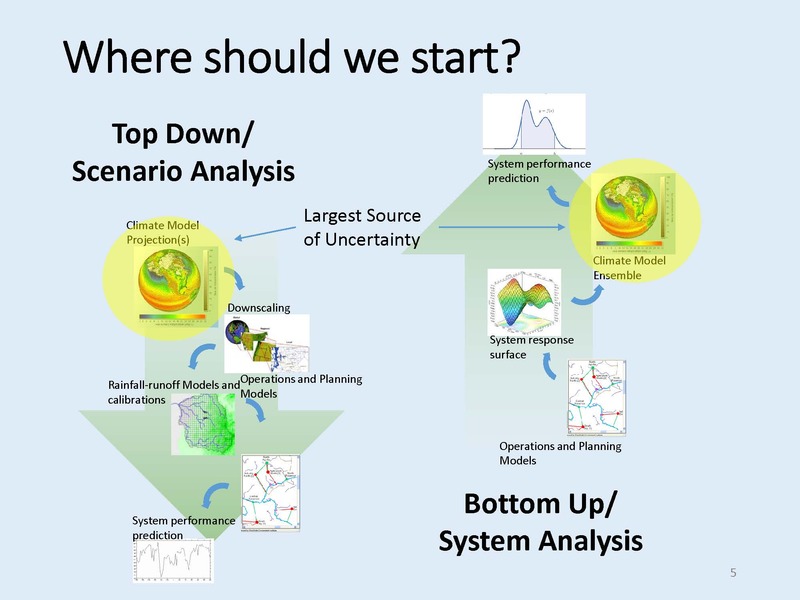 Mr. Schwartz noted that the previous presentation described a top-down scenario analysis approach starting with the climate change models, selecting ten scenarios from climate change models and representation concentration pathways that the state has chosen, downscaling them, running them through a hydrologic model and CalSim 3, and then getting system performance predictions. What comes out of that are some projections such as the impact of Delta exports could be anywhere from -44% to +27%, so how are decision makers to go forward and make investments with that level of uncertainty? For this project, they took a risk management approach to make the information more decision-relevant. They started with the system model, CalLite, which is a simplified version of the CalSim model, and they fed the model many different scenarios to understand how the system reacts when things are warmer, wetter, and drier and how that in turn affects things like reservoir storage, Delta exports, and Delta outflows. That gives a range of how the system responds; they then looked at how likely it is that a situation would occur where there would be a bad response out of the system. Mr. Schwartz then explained how they got to these projections. 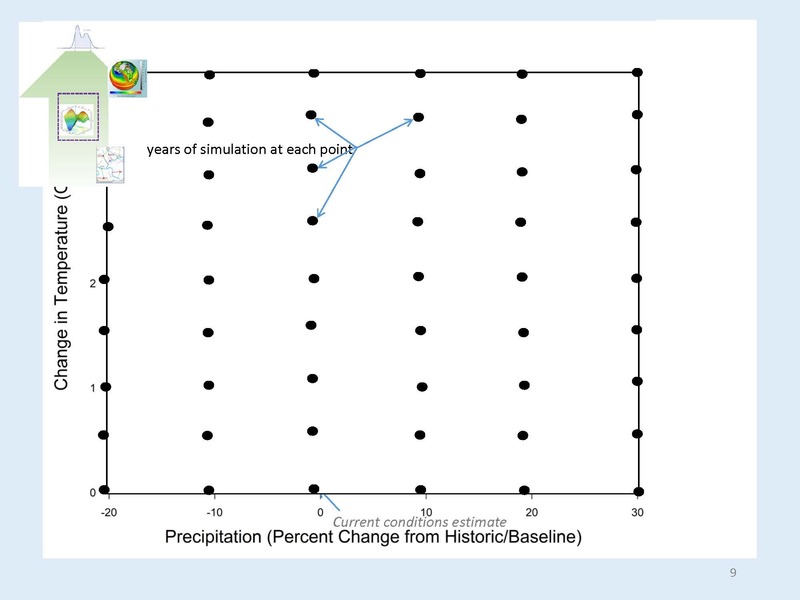 He presented a grid showing change in temperature plotted against change in precipitation, and said that each of these black dots represents a simulation they performed using the CalLite model. At every one of these combinations of temperature change and precipitation change, they ran an 1100 year simulation using data from paleo records of tree ring reconstructions which included longer droughts. He noted that at the ‘00’ mark, there’s no change in temperature and no change in precipitation from current conditions; that’s what can be delivered right now. The black line represents combinations of climate conditions where the project could continue to deliver about the same amount of water; so actually if it gets warmer, deliveries can probably be maintained as long as there is about 10% more precipitation every year. The colors represent the percentage change in the ability to deliver water. The red or orange colors are conditions are worse than historical conditions; the blue and green colors are better than historical conditions. The circle is the same plot of climate change shown a few slides earlier now imprinted over the response surface. He noted that the response surface is not time dependent; it is agnostic with respect to time. It just shows the response of how our system responds to warming, whether that warming occurs tomorrow, or in 28 years or in 50 years, he said. Mr. Schwartz said that figures he just presented were for State Water Project deliveries, but they performed the analysis for a whole range of other impact metrics that are important. He presented a summation of those other impact metrics, and pointed out that there are very high probabilities of inferior condition situations across a whole range of different metrics. “Specifically, carryover storage gets hammered because of the seasonal pattern shift and the warming with the water coming off earlier,” Mr. Schwartz said. In water management, the concern is what is happening from one year to the next. He presented a chart for Delta exports, explaining that the bell curves are based on all of the data underlying the response surface and the climate model data to calculate an expected value for the 11 years of simulation across all the different uncertainties in climate. 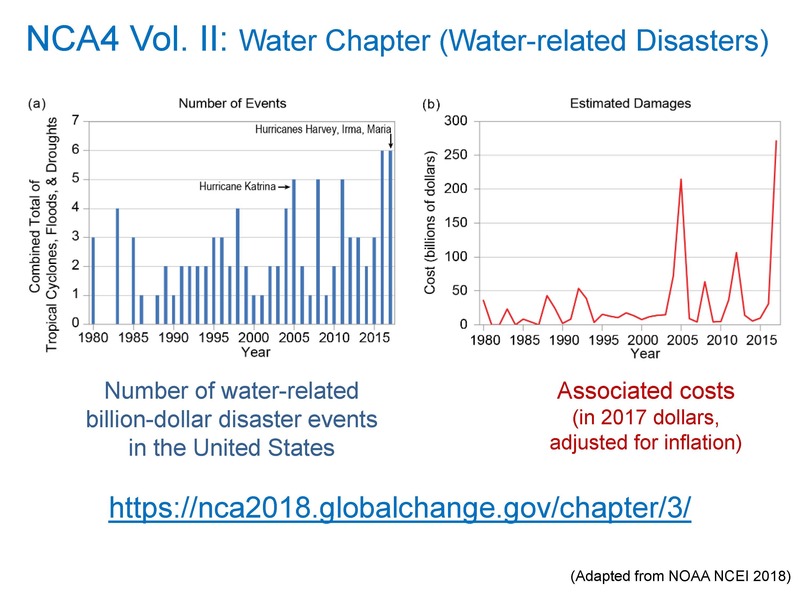 He explained that the blue line is the historical climate; there has always had a range of deliveries from very dry years to very wet years and the current system was designed to handle that to a certain extent; the red line shows how it moves across the uncertainty range. 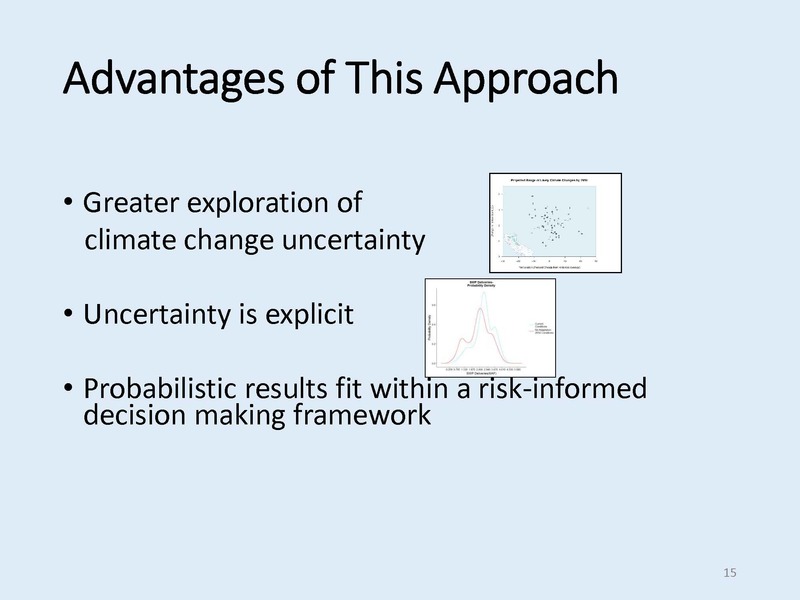 Mr. Schwartz said that this type of information does a better job of exploring climate change uncertainty, being really explicit about the uncertainty that we face, and understanding that uncertainty, and then putting it in a probabilistic way that fits within a risk informed decision making framework which we are very comfortable with as water resource managers. Chair Armando Quintero noted that as a result of the recent drought, most water agencies are really looking at diversifying their water portfolios. It’s promising to see that Los Angeles just passed a local measure to fund $30 million a year for stormwater capture and treatment and putting that into their water supplies. “I think part of what you’re doing here is really making the case that water agencies throughout the state really need to look at local solutions, but at the same time be focused on things that you raised,” he said. “It would be great to see how we can really use this extra water and put it into groundwater storage,” said Commissioner Ball. 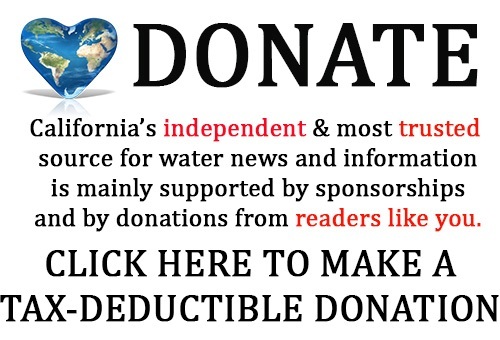 Sign up for daily emails and get all the Notebook's aggregated and original water news content delivered to your email box by 9AM. Breaking news alerts, too. Sign me up!